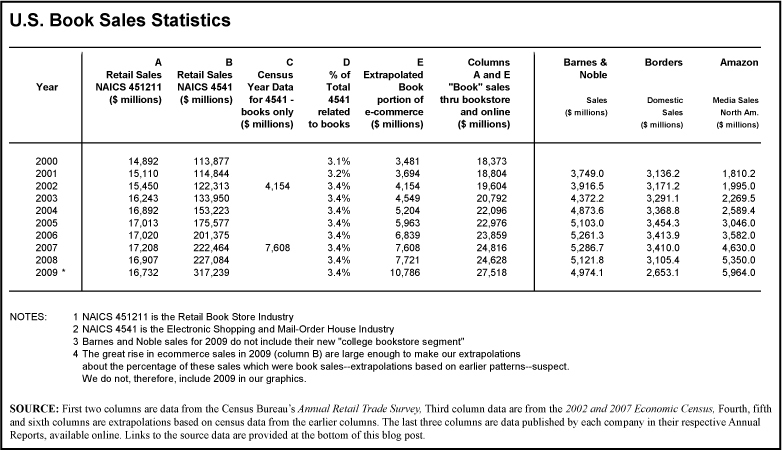 Today we’ll match up Census Bureau statistics on the U.S. retail book industry with the sales reported by the top three booksellers—Barnes & Noble, Amazon, and Borders—in their respective Annual Reports. 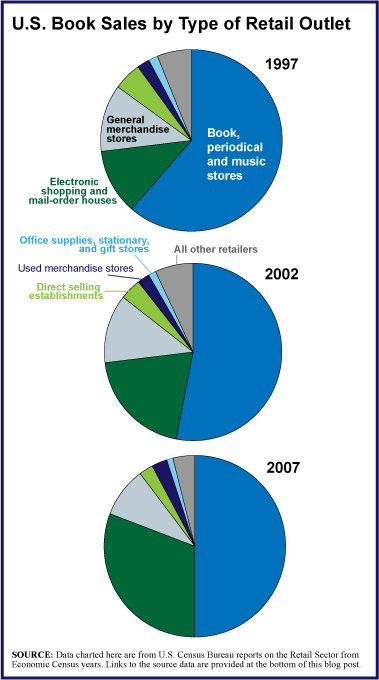 In order to try and capture the rising importance of eBooks in the overall book selling business, we have used Census Bureau data on the Retail Book Store industry and combined it with the book portion of the Electronic Shopping and Mail-Order House industry. 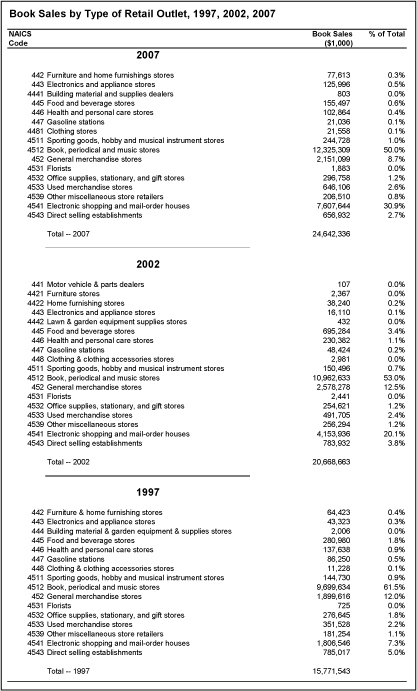 Census data is not broken out by product except in Census years and therefore we extrapolated the book portion of the Electronic Shopping industry for non census years based on their percentage of the industry in census years. These extrapolations are shown in detail in the table at the bottom of this post. 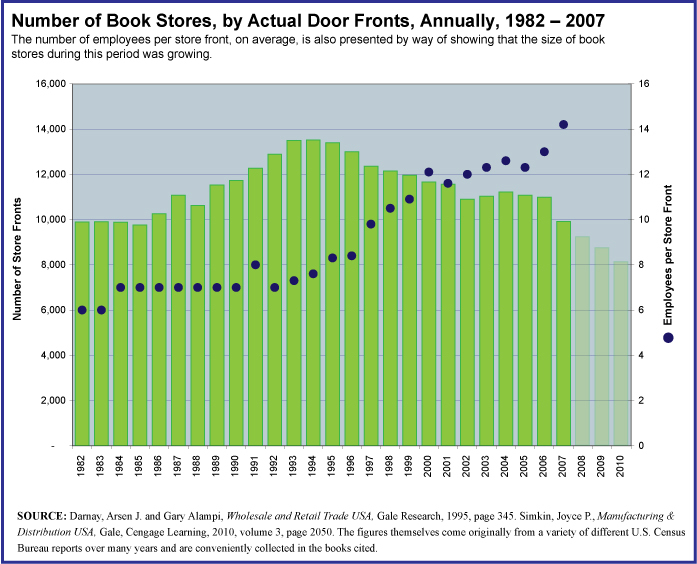 We thought it was particularly interesting that the top three booksellers, together, grew to represent 55% of book sales in the United States in 2008, up from 46% of the market in 2001. 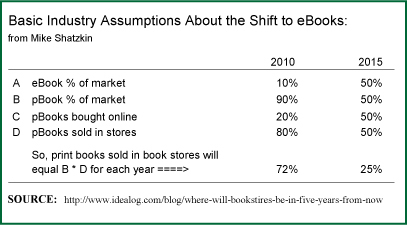 Thus, all other booksellers have seen their combined market share fall to 45%. The experience of each of the top three booksellers between 2001 and 2008 has, of course, differed greatly. 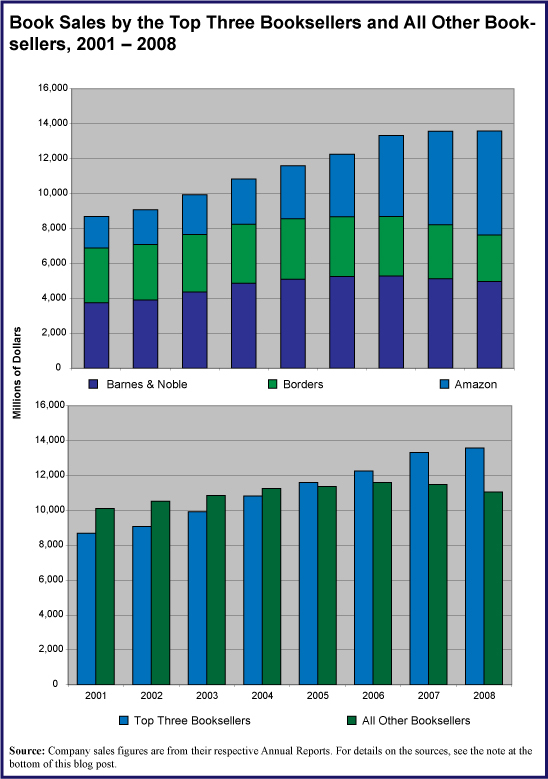 While Barnes & Noble’s market share has held steady at approximately 20% from 2001 to 2008, Borders saw its share shrink from 16.7% to 12.6%. Over the same period, Amazon has more than doubled its market share, from 9.6% in 2001 to 21.7% in 2008. Note on age of data. In a day and age when we are all quite accustomed to being able to get almost instant satisfaction to any question we may have—just check the global brain, the Internet—it is understandable that many people find it very hard to appreciate that when it comes to national economic statistics, real data takes several years to collect and compile. Thus, in this world, 2008 data is, actually, quite current. During 2010, the 2009 data are being collected from thousands of entities, compiled, standardized and checked. They’ll be reported on, at the earliest, in December 2010 and more likely in early 2011. Educated guesses on what happened in 2009, based on surveys, for example, can, of course, be made. But, do not mistake those guesses with actual census data! Patience… the picture will become clearer in time.